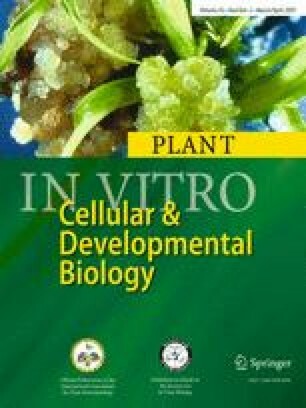 This study reports spore germination, early gametophyte development and change in the reproductive phase of Drynaria fortunei, a medicinal fern, in response to changes in pH and light spectra. Germination of D. fortunei spores occurred on a wide range of pH from 3.7 to 9.7. The highest germination (63.3%) occurred on ½ strength Murashige and Skoog basal medium supplemented with 2% sucrose at pH 7.7 under white light condition. Among the different light spectra tested, red, far-red, blue, and white light resulted in 71.3, 42.3, 52.7, and 71.0% spore germination, respectively. There were no morphological differences among gametophytes grown under white and blue light. Elongated or filamentous but multiseriate gametophytes developed under red light, whereas under far-red light gametophytes grew as uniseriate filaments consisting of mostly elongated cells. Different light spectra influenced development of antheridia and archegonia in the gametophytes. Gametophytes gave rise to new gametophytes and developed antheridia and archegonia after they were transferred to culture flasks. After these gametophytes were transferred to plastic tray cells with potting mix of tree fern trunk fiber mix (TFTF mix) and peatmoss the highest number of sporophytes was found. Sporophytes grown in pots developed rhizomes. The authors gratefully acknowledged a research grant (NSC 95-2317-B-039-002) from the National Science Council, Taiwan.